This December, 621 Gallery is excited to share three new exhibitions by artists local and regional! Amy Fleming grew up wanting to be an archeologist. Although life went in another direction, she maintains her love of found objects and the stories behind them. Anything that shows its history through damage, dents, fire, wind, rain and sun are especially interesting. I spend a lot of time in the woods near my home in north Florida, digging through old dumpsites and collecting bones after deer hunting season ends. There is often a theme to the discards I find out there: a toaster next a coffee percolator and a shot up refrigerator, or a busted up typewriter with a ruined time clock, maybe a side view mirror and a piece of a car horn. There are plenty of interesting discards around the city as well: broken bird baths, vintage floor waxers, and damaged toys left on the curb to be either rescued by my pick up truck or carried off by city services, whoever gets there first. I pull these things out of the ground and off of the curb, and imagine the stories behind them. Sometimes my own stories find their way in. Printmaking was my first love as an artist, and is the primary medium in my newest series of print and print based collages that focus on ageism. Our Lady of the Salvage Yard is the first of this series, depicting an older woman resplendent in a halo of transmissions and radiator hoses and a crown of headlights. The project entails photographing people 60 years of age and older – the older the better. Age is the only restriction for participants in this project, ethnicity and gender remain open, although the images will primarily focus on women as the primary targets of this form of discrimination. 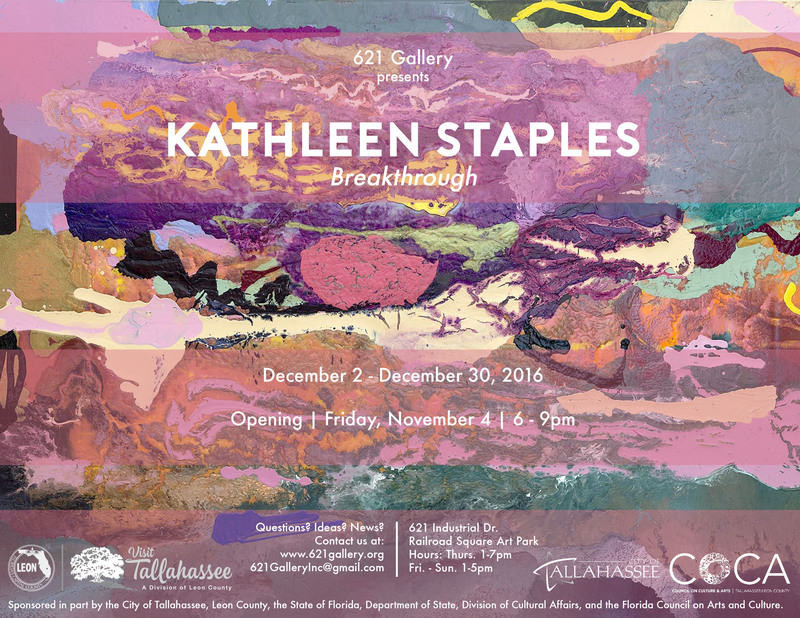 Kathleen Staples: Breakthrough (Miami, FL) featuring tactile and materially driven paintings will be installed in the front Main Gallery, an immersive, forced perspective installation by Cornelia Oliver: KORNELIAHAUS (Tallahassee, FL) will be featured in the back Main Gallery, and Amy Fleming: All Your Dream Furniture (Tallahassee, FL) will be showing dioramas assembled with recovered, printed, and handmade materials and screen prints in The Nan Boynton Memorial Gallery! 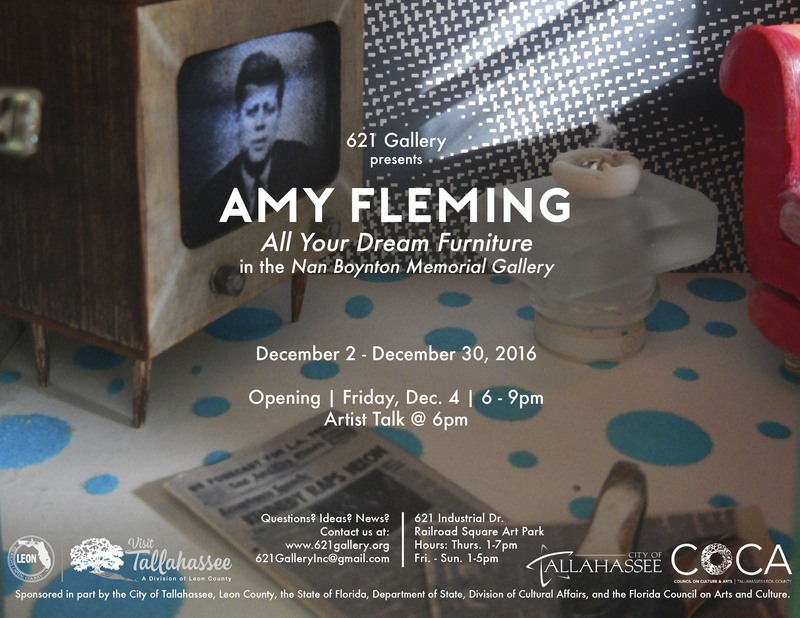 An artist talk by Amy Fleming will be begin at 6pm in the Nan Boynton Memorial Gallery! Kathleen Staples was born in Mexico and has traveled extensively. She earned her BFA at Parson’s School of Design and her MFA at the University of Miami, where she teaches art. Her work has been shown in numerous exhibitions and is in many private collections. Awards include the Individual Artist Fellowship from the State of Florida. These paintings are abstract in style and created using water-based acrylic paint, exploring the extraordinary variety of visual effects available in this material. I work with fluid paint, wet on wet, that behaves with many watery characteristics. Water is colorless, reflecting the blue sky or the flaming sunset. It floods and surges, so I pour and push the paint in an expressive “go with the flow” metaphor. Each layer I paint interacts with the layer underneath and the one above, and layers of fluid paint suspended in acrylic medium laid down at different stages of dryness create different transparency, surface effects, and texture. When I tip the work surface to make the paint flow and blow paint across the picture with a powerful fan the paint moves differently at different viscosities. Surrendering to this flow of wet paint rather than shaping it with my hand makes me feel that I am working with natural forces such as those that shaped the earth. The paintings have rough, expressive surfaces that evoke the surfaces of natural terrain, in an exaggerated, fantastic, sense; these parallel the natural forces of landscape. I find the process-based development and resolution of these paintings a very exciting and rewarding experience. I am continually surprised at how each painting resolves itself, independent of my control. Just as being in the natural element of water is an experience that is all encompassing: the floating, the sinking, the loss of control in the current that takes me somewhere else, so is it when I am in the process of painting. I have the sensation of being one small thing in the immensity of the creative process. Water is transparent and also conceals the deep. My paintings express my wonder at the beauty of the surface and also attempt to reveal a glimpse of the sublime as landscapes of my inner creative self. I intuitively express this with color, the “soul” of the painting. 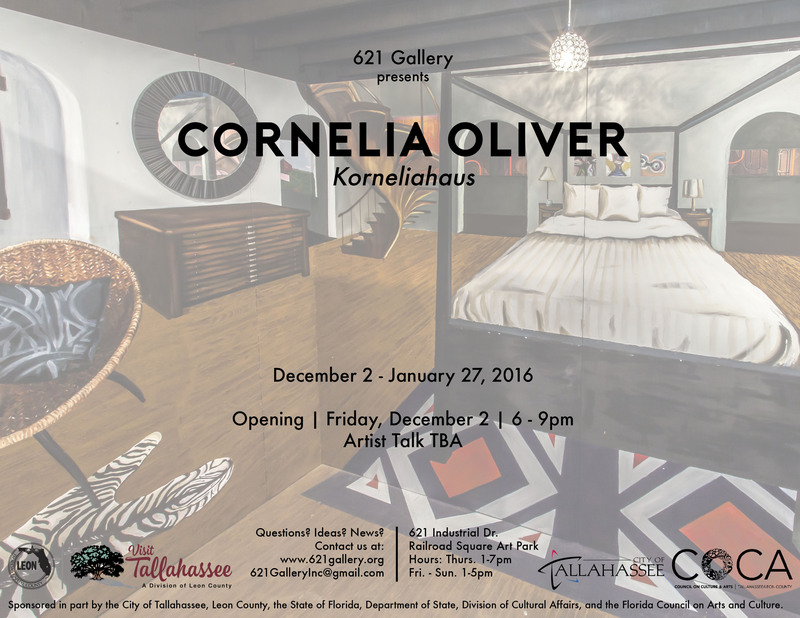 Cornelia Oliver is a Gulf Coast artist who came to Albuquerque to complete her MFA at the University of New Mexico. The cultural fabric of her childhood in the Deep South and the people, textures, and colors of the places she has visited have had a lasting influence on who she is and the art she creates. Through the use of evocative imagery, Cornelia feels an artist not only tells a story, but allows each person to interpret and find their own truth in a work; believing this to be the moment in which the work has, in fact, become real. Pablo Picasso stated, “Art is the lie that enables us to realize the truth.” Cornelia’s art reflects this same spirit and drive. Art is the reflection of a creative dialogue with another human being. It speaks to provoke, tease, sooth, and most of all, challenge the viewer in an ever expanding globalized world culture. To be successful, a piece must connect to a fundamental emotive strain within the viewer: In essence, my fabricated reality becomes an accepted and binding truth. In my work I very much hope to gain perspective on not only my own sense of self as an artist, but on what it means to be an artist today, and where we blur the lines between different fields of study in observation, architecture, experimentation, mimesis and representation. I seek to emancipate viewers from their specific surroundings while uniting them, through material exploration, color, pattern, immediacy and visual commentary, to embrace a larger moment in human existence. It is this moment where I create my truth amongst the existing realities today. After years of work I have just launched “KORNELIAHAUS: Home”, my immersive and interactive painting space. This experiential artwork is meant to serve as a pop- up outpost of my movable empire of me. It is a crossover piece combining architecture, theater, performance, design, and fine art, and ultimately a delving into identity through memory and touch.